Avin has suffered from epileptic fits since he was born. As he grew up, performing simple tasks such as tying his shoelaces and buttoning his shirt proved difficult. Abandoned by her husband, his mother, Mdm Lee, took it upon herself to teach him everything she could - and she did so tenderly. She bought him bubbles and candles to practice blowing. She patiently and painstakingly showed him how to move his fingers to improve his motor skills. Before long, Avin, the youngest of her three children, was living the happy, fairly normal life of an able-bodied boy, able to talk and eat on his own with only a mild intellectual disability. Then tragedy struck. In 2015, when he was 12, a severe epileptic attack came at the worst of times – a public holiday. By the time the ambulance finally arrived, seizures had set in that lasted the entire journey to NUH. He was unconscious by the time paramedics wheeled him into the emergency room. Although Avin spent 107 days in hospital, including two weeks in intensive care, Mdm Lee rarely left the waiting room. Exhausted and stressed, she stood by as her little boy endured the pain of operation after operation, dialysis, blood tests, and being tethered constantly to a drip. Since his release from NUH three years ago, Avin has been paralysed from the neck down, bed-ridden, and able to move only his head, eyes and mouth. He can no longer write, speak or move. Mdm Lee is not sure if he even understands his condition or recognises his home. Her estranged husband works in Malaysia and returns only once a week to provide money for her, Avin and their two daughters but nothing more. Avin has also developed Type 1 diabetes, so Mdm Lee gives him daily Insulin Injections too. “I used to be very afraid of needles,” she says. “But now it’s a small thing that I wouldn’t fear anymore.” She was taught all these skills by the nurses and doctors that she became acquainted with during the long months at NUH. Regulating Avin’s intake of food and water, monitoring his insulin levels and administering his many medications is a struggle and Mdm Lee knows it must also be uncomfortable, possibly even painful, for her son. But she keeps in mind that it is necessary for his well-being – and that’s what motivates her to never falter. “There are other children out there worst off than Avin,” she says. She also says that as Avin cannot communicate with her, she relies on her Mother’s intuition to figure out what’s wrong with her son or what’s making him uncomfortable and tried to adjust for it accordingly. Despite Avin’s disabilities, Mdm Lee still sends her son to school at Rainbow Center on Margaret Drive. She wakes up at 5am to prepare his medications and food before going downstairs where the school bus picks them up at 6.30 am together with 4 other wheelchair-bound children. Mdm Lee stays with him at school until 12.30pm before they head home together. As a result of the constant attention her son needs, she never gets a good night's rest. She is only able to sleep two to four hours a day. She puts on a courageous front and is grateful for the chance to be with her son and do all she can for him but at the end of the day, she is emotionally, physically and mentally drained. “I cannot give up. Who will look after my son if I do?” she says. Club Rainbow Singapore (CRS), thus, has been there to help Mdm Lee. It provides monthly supportive counselling to help her manage the stress of caring for Avin, something for which she is most grateful. “If I am not happy and not healthy, how am I to look after my son?” she says. Her family receives monthly food rations and diapers from the centre and was also recently awarded with a refrigerator donation. Moreover, CRS has also provided transport support for Avin to fetch him to and from hospital for his monthly medical appointments at NUH. Although it barely begins to relieve the strain of caring for Avin, all this support does go a long way to ease her financial and emotional burden and remind Mdm Lee that she isn’t alone. Keen to help other children and youths like Avin? Click here to donate to Ride for Rainbows 2019, our annual night cycling event that aims to raise funds for children who have chronic illnesses and their families. The poet Victor Hugo once said, "What makes night within us may leave stars”, a lovely quote about finding the light in darkness. The quote also aptly describes 21-years-old Nur Hazirah’s life, and how she found her light in spite of it all. From a young age, Hazirah was aware that her life would not be ordinary. She recalls an early memory of needing to consume many pills and getting frequent jabs, which are things that most children do not have to go through. Her parents did not tell her at first about the reasons behind the many medical treatments she had to undergo, only that she had to do it. Hazirah was born with thalassemia major and HbH disease. Persons with thalassemia may produce less haemoglobin (a red protein which transports oxygen) and have fewer red blood cells in their body than normal. As a result, they suffer from anaemia, which causes symptoms like fatigue, weakness and slowed growth. For Hazirah, her treatment regimen consists of an 8-hour infusion of medicine, followed by two pills in the morning. This has caused some restrictions on the experiences she could enjoy while growing up. The condition also makes Hazirah prone to falling ill. She recalls missing 3 or 4 days of school every month, which led to her studies being affected. The bullying started in primary school, at a critical age when children are starting to be aware of their individual differences; it did not get any better even when she progressed to secondary school. It was only after years of torment that she found the courage to confront her bullies, while in upper secondary. She felt depressed and lost. At some time, while still in primary school, Hazirah and her family joined Club Rainbow, upon the suggestion of a family friend. “Good thing I joined Club Rainbow, I received a lot of support there,” says Hazirah. Club Rainbow’s tuition sessions helped her to catch up with her schoolwork, and Camp Rainbow allowed her to meet new friends. Importantly, she also got to know Sylvia, who was Club Rainbow’s social worker assigned to her, and who supported her emotionally through the difficult adolescent years. Through those dark times Hazirah persisted on, and finally had the light come into her life when she graduated from secondary school. Unlike her classmates in secondary school, her coursemates in ITE were friendly and supportive of her despite her condition. She graduated from ITE in mid-2018. “In ITE, I felt like I could finally breathe,” she says. More challenges lay ahead. Tragedy struck when she lost a dear friend that she met at Camp Rainbow; this friend helped to draw the shy Hazirah out of her shell and made efforts to make her feel included in activities. The two were close, and Hazirah felt grieved when he passed. But unlike the past, where she would keep her emotions and feelings to herself, she understood that she could rely on others for help and found the strength to reach out to Sylvia. Inspired by her mother, who is a special education teacher, Hazirah plans to go into the childcare and early education sector. She enjoys being around children and, as such, has actively volunteered at Camp Rainbow for the past 4 years. This has allowed her to meet, befriend, and support other young beneficiaries with similar conditions. “She is very resourceful, eager to find ways to help herself, and very proactive,” said Sylvia. The drive to improve herself is evident. Hazirah, who is interested in photography, tapped on Club Rainbow’s Talent Development Fund to take part in related workshops, and in return, has helped to take photographs during Camp Rainbow. To beef up her portfolio, she helps her friends with their photography projects, and is considering becoming a freelance photographer. Keen to help other children and youths like Hazirah? Click here to donate to Ride for Rainbows 2019, our annual night cycling event that aims to raise funds for children who have chronic illnesses and their families. When what was supposed to be a standard foetal check-up took unusually long to complete and Mdm Nurseriwaty Binte Rahim (“Nurseriwaty”) was shuttled between four different sonographers’ rooms to be examined, she had a nagging feeling that something was up. Finally, the consultant sat her down at the foetal medicine department to talk and broke the news that the child she was carrying would have spina bifida. Mdm Nurseriwaty felt her world come crashing down. She had kept the pregnancy a secret up until then, because she felt that it had happened too soon after her first pregnancy and she was uncertain how others would react. When informed of the heartbreaking news, she felt all the more alone and helpless. The spina bifida in Mdm Nurseriwaty’s unborn baby appeared as a sac containing a section of the spinal cord and spinal nerves that protrudes out of an opening on the baby’s back. Week after week thereafter, Mdm Nurseriwaty, who then decided to keep the news to herself, would attend at reviews alone and pray hard that there would be no further growth in the size of the sac. Mdm Nurseriwaty was determined to carry her baby to as close to full term as possible. Her heart broke when baby Durrani Asyraaf Bin Kamaluddin (“Asyraaf”) had to be taken away for surgery right after delivery by caesarian section. She could not see Asyraaf until after his surgery, and only at the Neonatal Intensive Care Unit, but she knew she had to be strong for him. Asyraaf is now seven years old. Mdm Nurseriwaty’s eyes beamed with pride when Asyraaf named his mother and elder brother without hesitation when he was asked who his favourite person in the world is. Living a fairly active life, Asyraaf is turning out to be the miracle that Mdm Nurseriwaty had hoped for. Spina bifida is a condition that could cause disability in all four limbs, but Asyraaf is blessed in that he can count soccer, basketball, playing the guitar, dancing hip hop and arts and crafts as hobbies he enjoys. Asyraaf’s interest in soccer in particular has been recognised and affirmed by Club Rainbow Singapore (“CRS”), and he is recipient of CRS’s Talent Development Fund. Asyraaf tries to lead a life as close to normal as peers his age, but it is not without challenges for him and Mdm Nurseriwaty. As spina bifida has caused the nerves in his system to not recognise certain organs in his body, Asyraaf is on medications for his bladder and bowels, and he has to be put on diapers. Asyraaf also has to have a catheter inserted and changed every 3 hours as part of the Clean Intermittent Catheterization procedure that he has to live with. As a result, Mdm Nurseriwaty makes repeated visits to the school he attends every weekday, to ensure that Asyraaf gets a change of diapers and catheter. She does this in addition to having to care for two other younger children, and having to manage a home-baking business she runs under the name of “Violet Frost”. Mdm Nurseriwaty recalls facing resistance from the school initially for her frequent visits, due to the little awareness people have over her son’s condition. Thankfully, the problems have now been resolved with hard work and patience on Mdm Nurseriwaty’s part. Mdm Nurseriwaty and Asyraaf have also found much help from CRS over the years, ranging from solutions for her practical needs to socioemotional support. The family has received financial assistance from CRS and regularly receives food rations, milk and diapers from CRS. Asyraaf has also attended the various events which CRS organises for its beneficiaries, such as excursions to the zoo, safari, and an indoor playground. There has also been programmes availed to Asyraaf such as anger management classes, drama workshops and art jamming sessions. Through these various events, Asyraaf and Mdm Nurseriwaty have had the opportunity to meet other children with chronic conditions and their caregivers too. The continuity of volunteer support for events like Kris Kringle and Camp Rainbow also ensure that caregivers like Mdm Nurseriwaty can get much-needed time off caregiving, a welcome break for many who shoulder the caregiving responsibilities alone, day in and day out. Asyraaf and his family had been given the chance to go on a yearly cruise retreat organized by CRS. This is one of CRS’s most popular events as many of the CRS’s beneficiaries can never get a chance to travel overseas otherwise. The cruise retreat is organised in a manner such that the medical needs of the beneficiaries will all been taken care of. Financial difficulties with the costs of travelling are also eased as the beneficiaries of CRS receive full subsidy. As a result, being given the opportunity to go for this cruise retreat has been a dream come true for Asyraaf. In order to extend the opportunity to travel to every beneficiary and their families, CRS offers subsidised rates for every family so that the entire family can have the opportunity to go on a family vacation together. Needless to say, Mdm Nurseriwaty is very excited to go for the cruise retreat with her son herself. Mdm Nurseriwaty organized a fundraising bake sale specifically for raising the remaining funds that are required. Her children were so excited that they had on their own initiative offered to help her with baking more goods in hope that sufficient funds may be raised. Such positivity in making good of every situation thrown her way is indeed the hallmark of Mdm Nurseriwaty. Gone are the days of tears and heartbreak. Today, she is able to say confidently that Asyraaf is a blessing to her and she has been made a better version of herself through having Asyraaf in her life. Laughing, Iszanah throws a pillow at her eldest son, Eriyandee, 17. “Ok, so you think you can stand now? I give you five seconds,” she challenges him. “1, 2, 3, 4, 5.” He fails. “Again,” he demands. This time round he grabs the fridge door and hauls himself up into a standing position within five seconds. 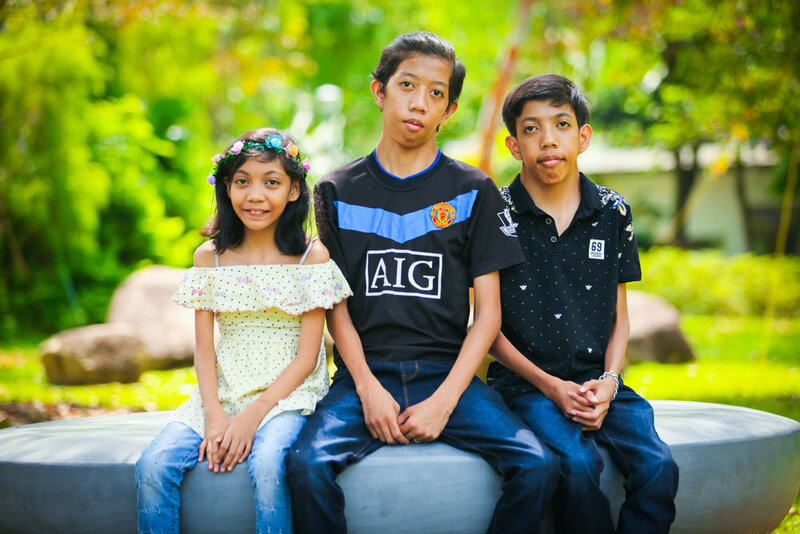 Eriyandee together with his brother, Eriyndanee, 15 and sister Eriyndatee, 10, suffer from Noonan Syndrome. Webbed body features, tender achilles and skeletal malformations make simple movements such as squatting on two flat feet or standing up from a sitting position a challenge. But her optimism belies very real financial troubles. She had quit her job to take care of her children and without financial assistance, Eriyndanee alone can chalk up monthly hospitalisation fees of $3000 - $5000. Her husband brings home $1600 a month and even though she takes on a part-time job, it is still insufficient. Financial support from schools, the hospital and organisations such as Club Rainbow has become essential. Apart from monthly bursaries, Club Rainbow provides monthly food rations of rice, milk, oil, salt, sugar, milo, tea, pampers, cereal and biscuits, which helps to cushion her monthly expenses. Janeth, a social worker from Club Rainbow, has also been an emotional crutch for her. For the children, social integration in school is a constant struggle. Unlike usual teenagers, the three siblings are short, skinny and weigh around 13-21kg. Eriyndanee shares that his schoolmates would flick at his webbed neck, making him dizzy, and call him names such as ‘Alien’. When they were in Primary school, him and his brother had stayed away from school for three months to avoid these hurtful comments. “Always think that you are lucky to have parents who love you. You can still walk, you can still eat, you can still laugh. Why should you be sad?” With this new mindset, Eriyndanee now stands up to his schoolmates and no longer feels bothered by the name-calling. Iszanah refers to her children as ‘special kids’ and believes that behind their disability, they have something which normal kids do not have. Eriyndanee for example, dreams of being a singer when he grows up. Unexpectedly, it was his singing that helped his parents to get over their initial internal struggles post their children’s diagnosis. It was only when Eriyndanee won a Kindergarten singing competition that things took a turning point. Eriyndanee had performed at the yearly Camp Rainbow and him and his siblings also participate regularly in activities organised by Club Rainbow. He is also a recipient of Talent Development Fund from Club Rainbow which enabled him to attend Cajon classes. Just as their mother had taught them to be, the children have grown up to be confident and independent. They exude a deep sense of pride when they speak of their performance at their respective workplaces now. Juggling a job at McDonald’s with his studies, Eriyandee reaches home around 11pm - 1am on working days. His dedication and stellar performance got him a promotion within three months to team leader and he hopes to become a manager by next year. With his first bonus, he bought phones for him and his brother. “So we no need to say, ‘Ma, we want new handphones’, we work for ourselves.” Following his elder brother’s example, Eriyndanee has also gotten a weekend job at Subway. The house is filled with laughter and the family is tight-knitted.